Here you can see a “money tree”. Thai people create these trees and then parade them around, or put them in a temple or in front of a shrine or other places. Then others can put a banknote in the tree, and it’s said to bring luck. After that, the money will be donated to a temple. 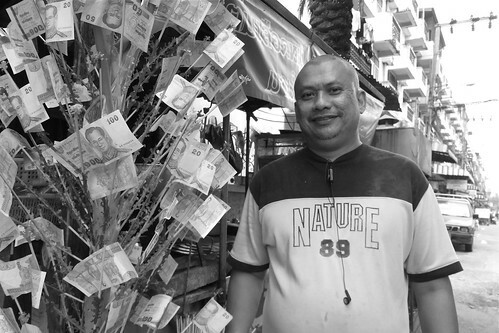 So in a way, money really does “grow” on trees in Thailand. The branches of the trees are made from split bamboo sticks, and you can just slide a note in. Depending upon where and who and when such a tree is “planted”, there can be hundreds or thousands of baht on such a tree. In Bangkok, most of the time it’s several thousand bahts, whereas in rural areas, sometimes it’s just several hundreds. Usually, when the tree is brought to the temple, it’s done with a big parade, someone carrying the tree, people playing music and cheerfully dancing and singing on their way – sometime you can see such a thing on a Bangkok sightseeing tour. For Thai people, making merit is a way of life. There is no “tax” like there is a church tax in Europe, it’s all completely voluntary. And it is very much alike here. There are so many different ways of making merit, and Thai people do it so often, it can be really surprising for Westerners to see. Even the prostitutes who work in bars will make merit and wai when they pass a Buddhist shrine, and there are shrines in bars to which they make merit. They belief that they can sell their body, but that as long as they don’t let that profession stain their souls, then everything is okay, because Buddha can understand. And to them, their soul belongs to Buddha. Parents already at a very early age let their children make merit, and sometimes you can see three generations making merit at a temple at the same time.